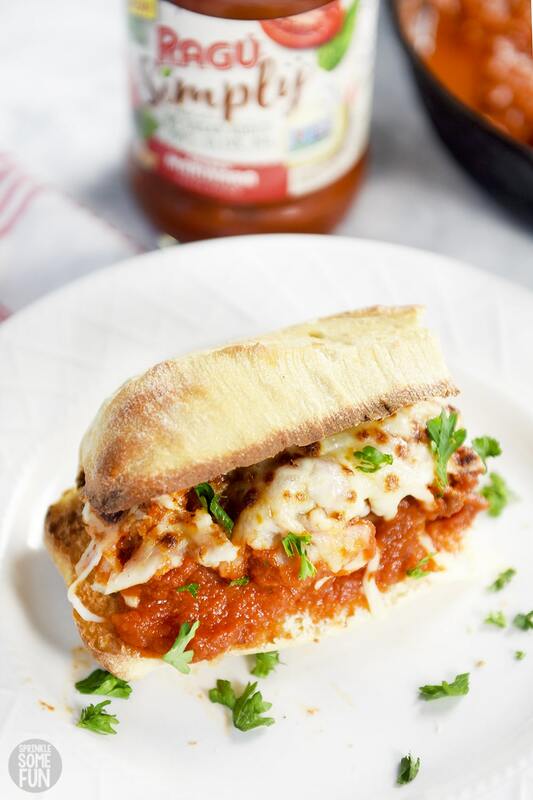 Meatball sub sandwiches are an easy weeknight dinner idea that the whole family loves. This recipe is so delicious with the homemade meatballs, gooey cheese, crusty bread and RAGÚ® Simply Chunky Marinara Pasta Sauce. I remember my first of many meatball sub sandwiches was at a local sub shop during our high school lunch break. We often visited this sub shop because it was one of the closest eateries that my friends and I could afford! I still remember that my mom would give me $20 a week for both food and gas (does that tell you how old I am?). Anyway, I remember that first meatball sub sandwich tasted amazing and I’ve loved them ever since. These meatball subs are just how I like them; full of meat, cheeses and tomato saucy goodness. 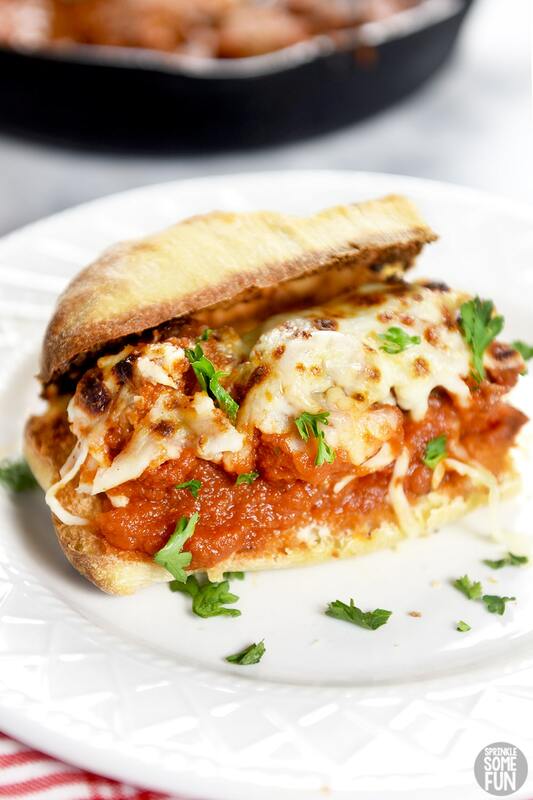 Follow this easy guide on how to make the best meatball sub sandwiches. 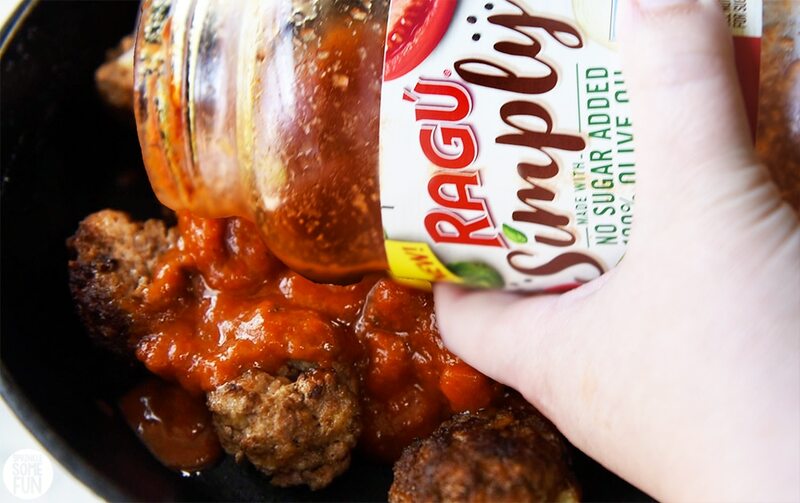 We love the fresh made meatballs, New RAGÚ® Simply Chunky Marinara Pasta Sauce and the melted mozzarella cheese on top. 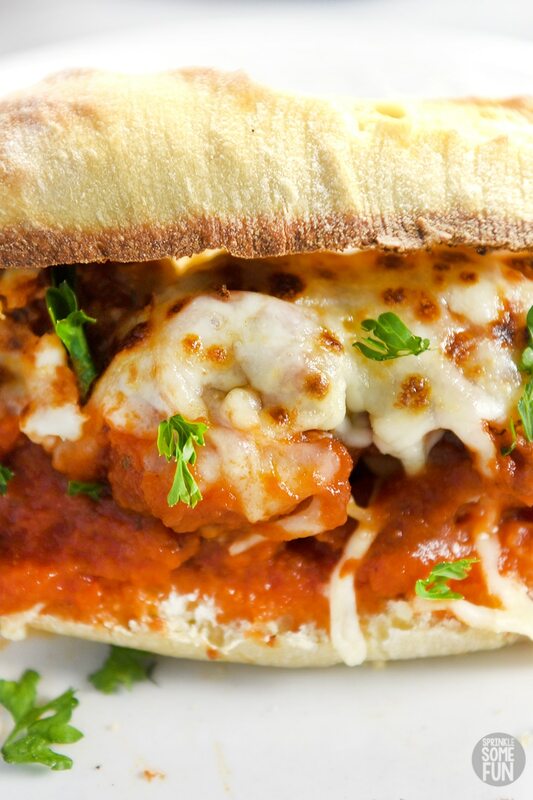 Plus, the fresh baguette makes it all come together into the best meatball sub ever. What is the best pasta sauce to use for meatball subs? You’ll need a delicious pasta sauce for this recipe because it’s the main ingredient that will make or break your meatball subs. New RAGÚ® Simply Chunky Marinara Pasta Sauce because is made with 100% Olive Oil and contains no added sugar. This is a big deal to me when serving foods to my family. I am always looking for no sugar added marinara sauces and there are never many to choose from. 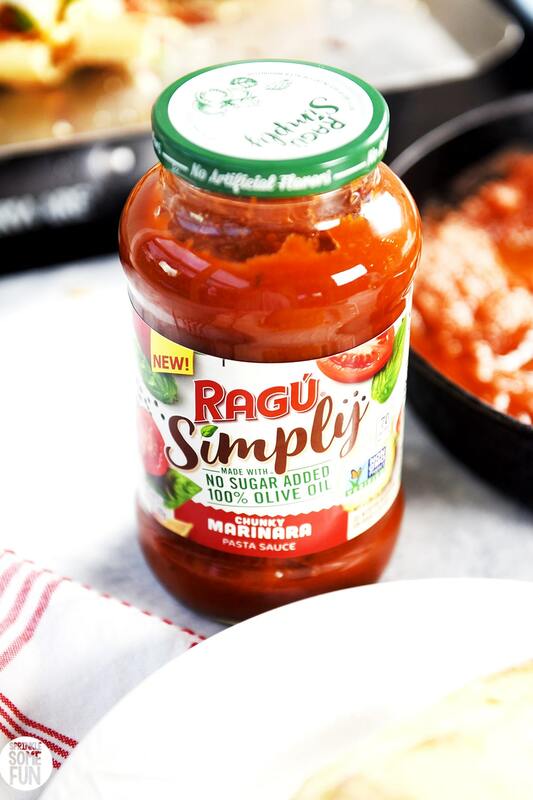 I love the New RAGÚ® Simply Chunky Marinara Pasta Sauce because it tastes delicious and uses simple ingredients like plump tomatoes, onions, garlic and spices. It pairs so well with the meatballs and gooey cheese too! It’s also thick which is perfect for a meatball sub sandwich. The next important ingredient for this recipe is obviously making the best meatballs for meatball subs. I really like to make mine homemade because I like the flavor and texture better. You can always use store bought meatballs if you want to make things quicker, but I highly suggest testing these meatballs out too. They taste so good and have a great meaty texture. I like to serve my homemade meatball subs on a chewy and thick piece of bread like a french baguette. I find that most soft sub rolls or buns just don’t hold up well to the sauce and the french baguette works great. 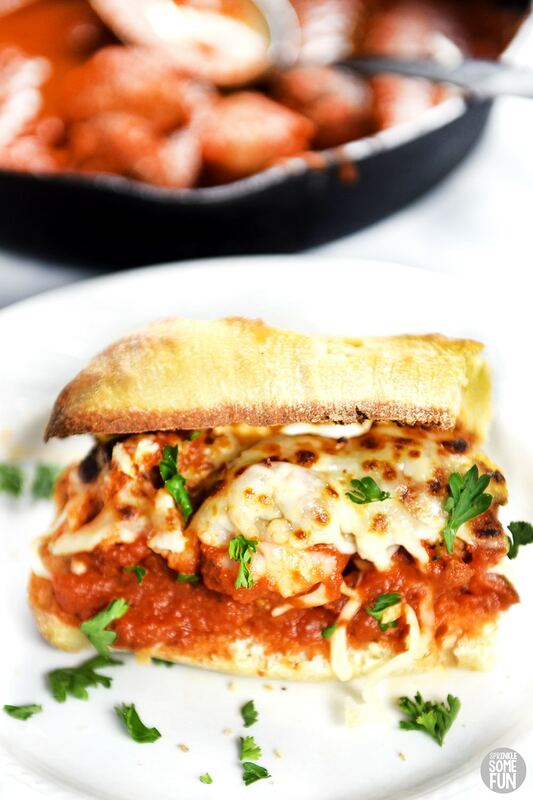 If you know you like a meatball sub on a softer bun then go for it. I just prefer my bread to be a bit denser/harder. I also toast my bread a little bit before adding the meatballs, cheese and sauce. 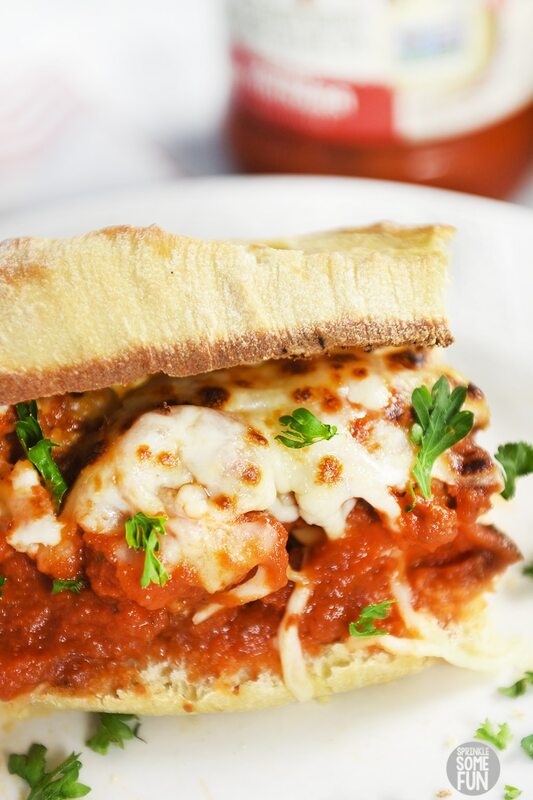 The last step to making the perfect homemade meatball sub is letting broil for a few minutes after you have added the cheese! This lets the bread crisp up a bit more too. A crispy bread won’t get too soggy as you eat it and allows you to really enjoy all that lovelyNew RAGÚ® Simply Chunky Marinara Pasta Sauce. Use fresh meatballs. The recipe I have below is delicious if you choose to try them! I love using stale bread that I have on hand for these. They make the best breadcrumbs. I’ve included cooking instructions for a baked version as well as a fried version. I prefer the fried meatballs, but the baked is tasty too (and easier). Use the best pasta sauce. 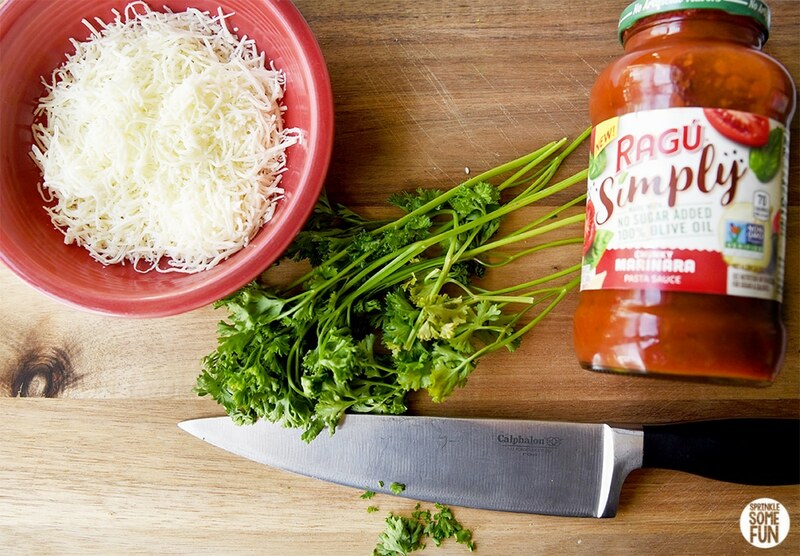 I recommend the New RAGÚ® Simply Chunky Marinara Pasta Sauce for both the taste and the best ingredients. Simply amazing stuff! Use a thick/chewy bread. You’ll need a thick bread to stand up to all that yummy sauce. Other breads have left me pretty disappointed in the past. No one likes a soggy meatball sub! You’ll also want to serve these immediately for the best results also. Fresh herbs. My favorite for meatball subs is parsley inside the meatballs and sprinkled on top. You can also use a little basil sprinkled on top (YUM). Use a gooey melted cheese. I love mozzarella and parmesan for meatballs subs. Another great choice is provolone. The non smoked kind is my favorite for these. Broil it up for a few minutes. Broiling these for just a minute helps to meld all the flavors together nicely. I love how the broiling adds just that little bit of the browned spots on the cheese and on the bread. 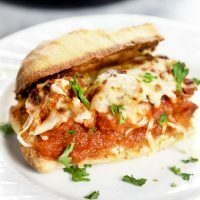 I hope you enjoy this recipe for meatball sub sandwiches! If you love it please give us a 5 star review below. 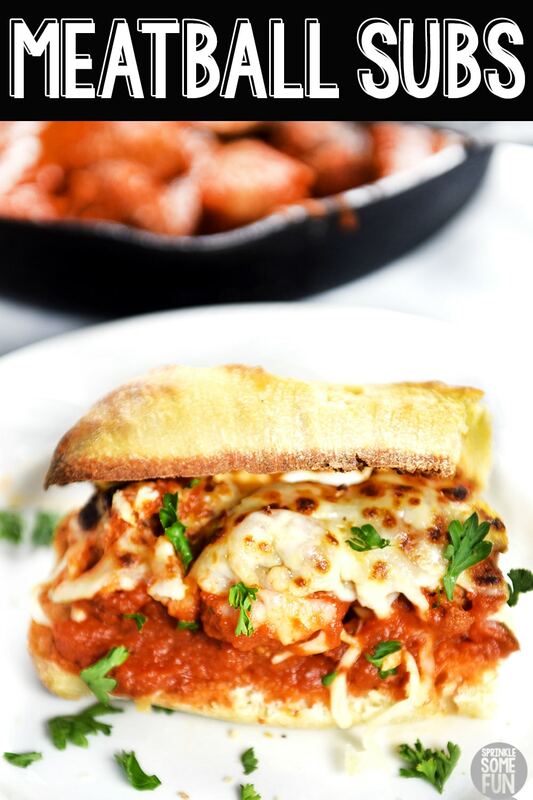 Meatball sub sandwiches are an easy weeknight dinner idea made with homemade meatballs, gooey cheese, crusty bread and chunky marinara pasta sauce. Add the beef or beaf and pork to a large bowl. Next, add garlic, eggs, cheese, parsley, salt and pepper. Mix in the bread crumbs into the meat/ cheese mixture then add some lukewarm water 1/2 cup at a time to make the mixture moist. It should still hold it's shape after adding the water. If it's too soggy add a little bit more of the bread. (I usually use about 1 cup of water). Shape this mixture into the meatballs. I make my meatballs for subs around 1 1/2 inches in diameter or the size of a ping pong ball (around 1 ounce per meatball). Heat olive oil in a large skillet or frying pan. Fry the meatballs in smaller batches if needed (you need space around each meatball to cook thoroughly. Meatballs should be very brown when cooked and have a slight crisp to them. Once they reach the right temperature (160°F for beef and 165°F for beef and pork mix) remove from the heat and drain on a paper towel. Take a new skillet or remove the oil from the first one and add the meatballs back to the skillet. Add the marinara sauce to this and stir. Set aside for next step. Use the same steps as above, but instead of frying use a sheet pan (with at least a 1/2 inch lip on it) to bake them on. Preheat to 500°F. Lightly coat 2-3 18x13" rimmed baking sheets with oil. Arrange meatballs 1/2" apart on the greased baking sheets (again make sure these sheets have a lip on them... do not use a cookie sheet!). Bake/roast the meatballs on different racks, rotating racks as needed halfway through, until lightly browned and cooked through at around 8–10 minutes. The last step to making the meatball subs is to take a cookie sheet or any baking pan and preheat the oven to your broiler setting on high. Toast the bread first by placing them inside out and broil for just a minute or until they are very lightly toasted (they will finish toasting in the next step). Add the meatballs and marinara mixture on top of one side of the bread. Add the cheese on top of the meatball/marinara. Broil again on high to melt the cheese. The cheese may have browned a little and the bread without sauce will look browned also. Take out carefully (it's so hot at this point). and set to cool for just a minute or so (or until you can handle them). Sprinkle a little fresh parsley or basil on top if desired and serve immediately.